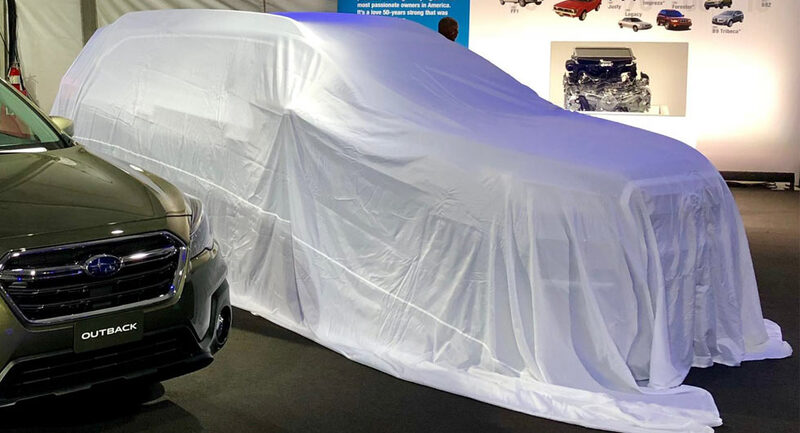 Subaru has a checkered past with three-row crossovers but that hasn't stopped the automaker from unveiling the 2019 Ascent at the Los Angeles Auto Show. Effectively a replacement for the Tribeca, the Ascent was previewed by a concept at the New York Auto Show and it adopts a more conventional design than its slow-selling predecessor. The model sort of resembles an Outback XL and this likely wasn't an accident as Carsalesbase data shows the company sold 182,898 Outbacks in the United States last year. To put those figures into perspective, Subaru only sold 65,306 Legacy models. We'll have full details shortly but the Ascent will be built at the company's plant in Indiana and ride on the automaker's global platform. The model is expected to measure 198.8 inches (5,049 mm) long, 78.3 inches (1,989 mm) wide, and 72.4 inches (1,839 mm) tall with a wheelbase that spans 117 inches (2,972 mm). Rumors have suggested the crossover will be powered by a new turbocharged 2.4-liter four-cylinder engine that produces around 300 hp (223 kW). Of course, we'll find out the final specifications soon enough.